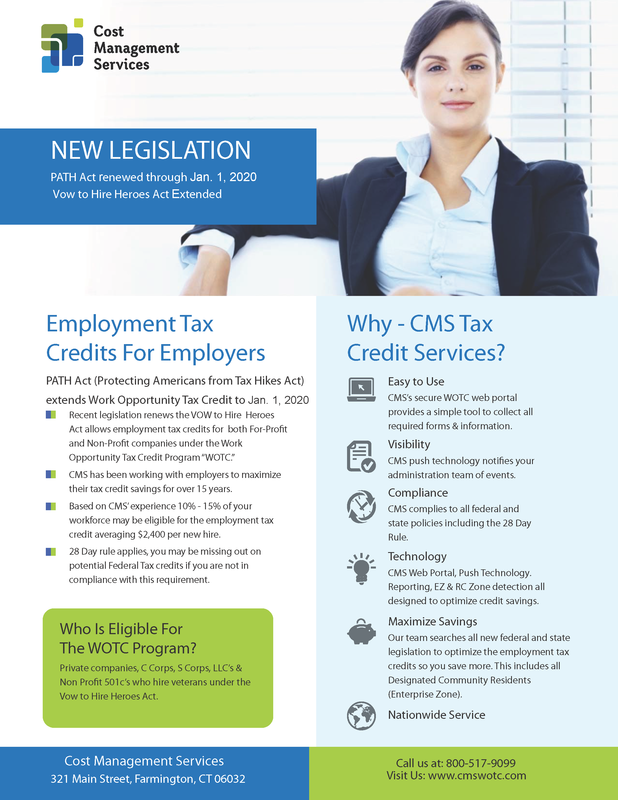 WOTC Questions: if I pay my employee a salary of $12,850 and his working hours are more than 600, what is my work opportunity tax credit? CMS Says: Congratulations on hitting the maximum number of hours (400) to qualify. Your actual credit may depend on the target group of employee. For example, if the employee was a SNAP (food stamp recipient), Designated Community Resident or Ex Felon, you qualify for a tax credit equal to 40% of $6,000 of first-year wages or $2,400. If he is a Veteran Hired 1 year after leaving service you qualify for a tax credit equal to 40% of $12,000 of first-year wages or$4,800. Or a Veteran unemployed at least 6 months, 40% of $24,000 of first-year wages or up to $9,600. Calculate Your Potential Credit Here. ← WOTC Questions: Do I Have To Fill Out the WOTC Forms?